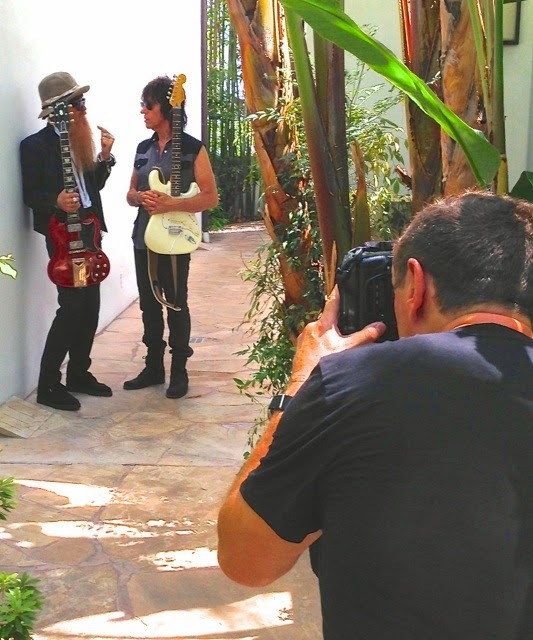 As final preparations have been completed for this month’s launch of the much-anticipated ZZ Top/Jeff Beck Tour, ZZ Top’s Billy F Gibbons met with Jeff Beck in Los Angeles for a photo session for the cover of the next issue of Guitar World Magazine. On hand to document the guitar slingers' summit was legendary British photographer Ross Halfin, who is seen here nailing down an intimate shot of the two guitar gods immersed in “fretful” conversation. Rock and Roll Hall of Fame inductees and mutual admirers ZZ Top and Jeff Beck who have almost a century’s worth of combined touring experience under their collective belts are less than one week away from embarking on their first ever tour together. The tour is formatted to offer a free-standing set from Jeff Beck, a free-standing set from ZZ Top and a joint performance wherein Beck joins ZZ Top for a rocking finale. On the heels of releasing Live At Montreux 2013 DVD/Blu-ray through Eagle Rock Entertainment and The Baddest of ZZ Top CD/2CD retrospective from Warner Bros., “that little ol’ band from Texas” will be cranking out classics such as “Sharp Dressed Man,” “Legs” and “Tush.” The lineup of Billy F Gibbons, Dusty Hill and Frank Beard has been holding steady for over 44 years - an unprecedented feat in rock. Jeff Beck’s touring band will consist of Grammy nominee and Flash-era vocalist Jimmy Hall (Wet Willie), bassist Rhonda Smith, drummer Jonathan Joseph, and guitarist Nicolas Meier. 21-year-old Texas guitar prodigy Tyler Bryant has recently been announced as the opening act for the vast majority of the tour dates. Bryant already has experience as an opener for Jeff Beck, and also cut his teeth on bills with Aerosmith, Lynyrd Skynyrd, BB King, Heart, Vince Gill, and many others.